One of the most exciting things we do here at Southern Exposure Seed Exchange is grow our favorite varieties to bring to tomato tastings to share with gardeners throughout the Southeast and beyond. Today I’ll show you how we sow tomato seeds in trays. First thing, before you start preparing flats, is to determine when to sow. Count back 6 weeks before your average last frost date to determine when to start tomato seeds in your area. Overly large transplants are likely to suffer more from transplanting outside, so don’t sow too early. 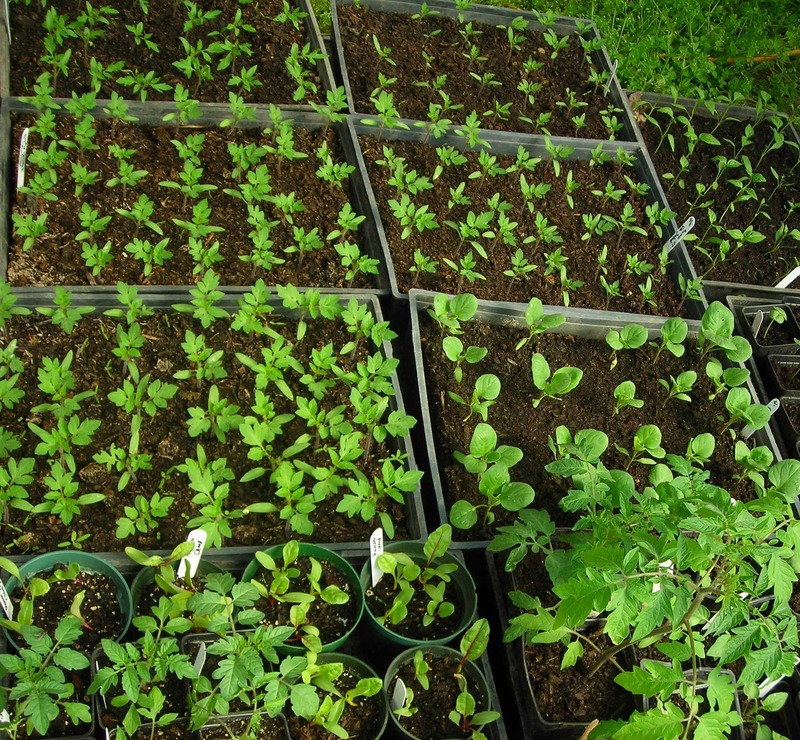 5- to 6-week-old seedlings are just right for setting out. For our April 25th last frost date, that means starting seeds around March 12th. We also make a second sowing 4 to 6 weeks later. 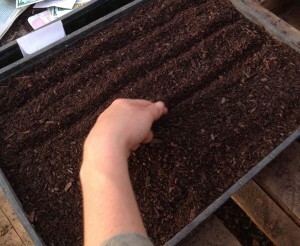 When we’re ready to sow, we make sure to have plenty of trays and potting mix on hand. We sow in six inch by twelve inch trays with good drainage slots. Trays are easier to keep evenly moist than split packs. For our potting mix, we use sifted compost mixed with peat moss to improve moisture retention. 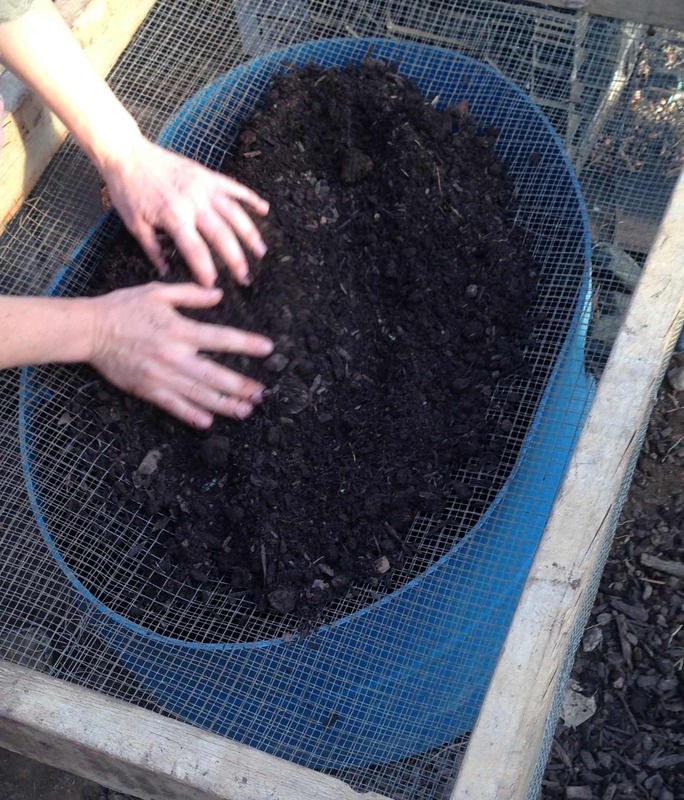 Sifting the compost produces a consistent mixture, without sticks or rocks, which will spread nicely into our trays. Once we have filled our trays with our potting mix, we draw four evenly-spaced shallow furrows no deeper than your first finger joint along each tray. Next we make labels for each variety and insert them at appropriate intervals before sprinkling seeds into the furrows. Here you can see the density that we use (about 4-5 seeds/in). 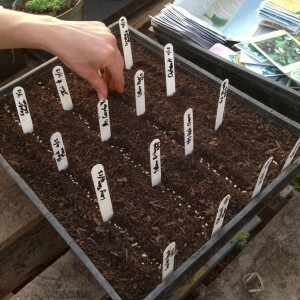 This gives us extra seedlings so we can choose the strongest and healthiest for potting up later. 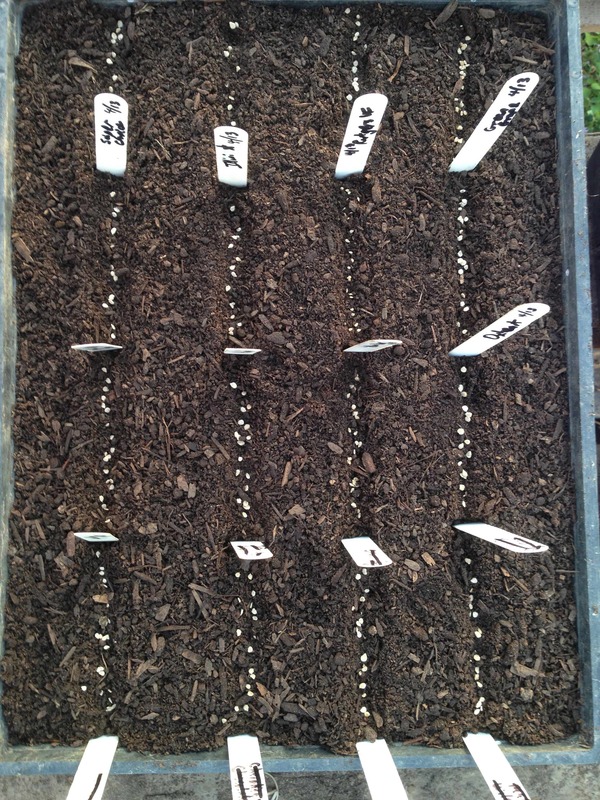 From the overhead view you can also see how much variation there is in the seeds among just a dozen of our varieties. 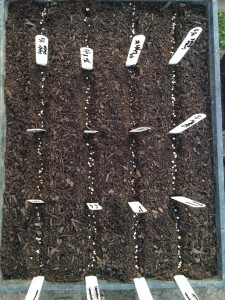 Some of the seeds are larger and flat while others are much smaller and rounder (see how small the Yellow Pear cherry tomato seeds are in the third column from the left, second interval from the top). Then we pinch the furrow together gently, without compressing the soil. We’re just trying to cover them up, not smother them. The rule of thumb is cover to cover tomato seeds no more than ¼ inch. Finally, a healthy watering and they’re ready to go! It is best to use lukewarm water and a watering head that delivers a gentle stream. Keep the flats moist but not soggy until the tomato seeds sprout. Do not let them dry out! 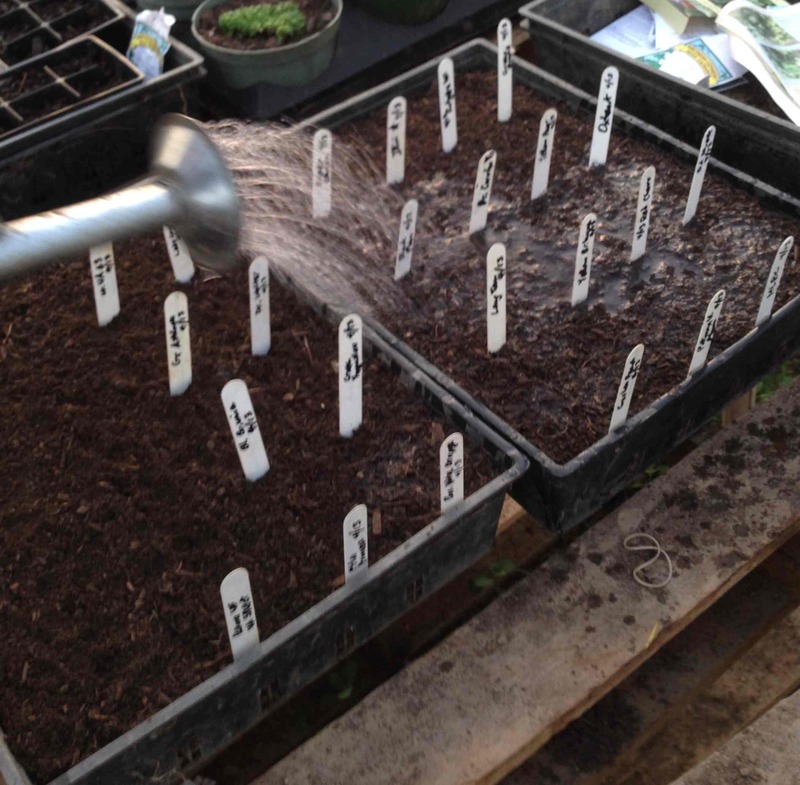 Protect your germinating trays from cool night temeratures. Tomato seed germinates best at 70 to 80 degrees Fahrenheit, but the seeds may be damaged at temperatures above 95 degrees. Look for your seeds to germinate in 4 to 10 days. 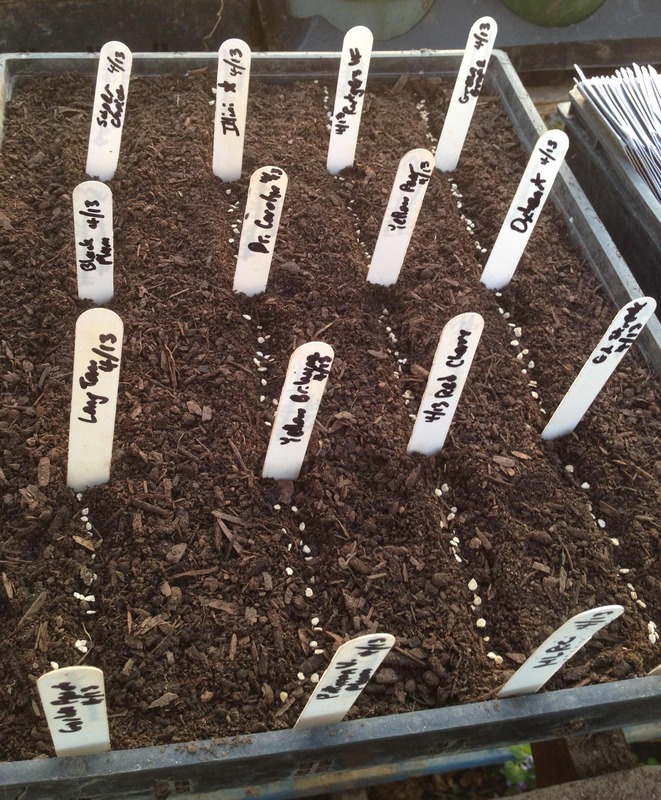 Tomatoes germinate best in the dark, but move them into bright light as soon as you see the seedlings emerge. Bright light is essential for strong sturdy growth. You can move the trays to a greenhouse or insulated cold frame. Indoors, you can use adjustable fluorescent lights kept 4 inches above the seedling tops. 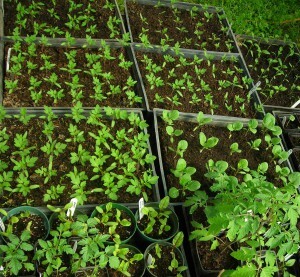 We keep our seedlings in the greenhouse. A fan simulates a mild breeze to encourage sturdy seedling growth and prevent fungal disease. You can also gently brush your hands across the seedlings one or two minutes a day to condition them. If you planted into a good well-screened compost your seedlings will only need occasional watering: keep them well-moistened but not soggy. Four days later we’re already seeing life!